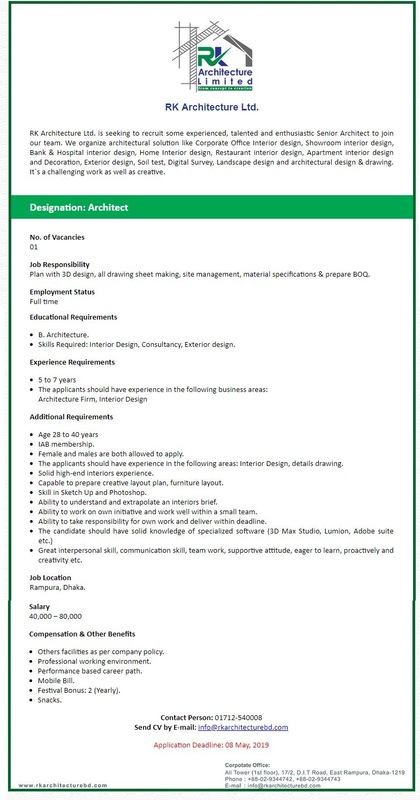 RK Architecture Ltd Job Circular 2019 has been published by their authority in daily online job portal and to get from the best jobs and the education portal website in BD Jobs Careers- www.bdjobscareers.com. For the user understanding, we would like to inform you that,RK Architecture Ltd. is seeking to recruit some experienced, talented and enthusiastic Senior Architect to join our team. We organize architectural solution like Corporate Office Interior design, Showroom interior design, Bank & Hospital interior design, Home Interior design, Restaurant interior design, Apartment interior design and Decoration, Exterior design, Soil test, Digital Survey, Landscape design and architectural design & drawing. It`s a challenging work as well as creative.